It takes some serious cojones to set your film's finale at the site of the world's worst nuclear disaster. You're just begging for a critic to write something snarky like: "It's a meltdown of epic proportions – sheer toxicity." And when that film happens to be the 27th fifth edition of one of moviedom's most lucrative - and tired - franchises, you're raising the risk of taking a critical blast to radiational levels. So how does A Good Day to Die Hard miraculously manage to avoid my doling out the aforementioned - and utterly brilliant - quote? By administering a bombastic onslaught of smashed-up machinery and king-sized explosions that adequately sates your neanderthalic needs. Yep, Bruce Willis is back as John McClane, the aw-shucks New York cop who wanders into more messes than a janitor at a rest area outfitted with Porta-Potties. 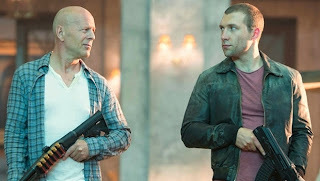 This go around finds McClane in Russia, incessantly bickering with his all-growns-up kid, Jack (Tom Hardy's taller doppelganger, Jai Courtney of Showtime's Spartacus), a CIA agent tasked with protecting a political prisoner who has some sort of computer file that's vital to our country's national security. I'm going to stop the synopsis there, the plot is - for lack of a more eloquent word - stupid. It's a load of overcooked, overwrought inanity that's best stashed far from mind – hastily. You don't walk into a Die Hard flick looking for the Russkie-styled tale of political backstabbing that screenwriter Skip Thorpe (The A-Team) dishes out. All that's required is unbridled mayhem, and man alive, does director John Moore (Max Payne) deliver. The shaky-cammed helmer goes bonkers with an escape sequence that makes a Bond opening look like a student film project. Not since Eddie Murphy was swinging from a chain on the back of a semi stuffed with stolen cigarettes has there been this many jacked-up cars. Moscow was less of a mess after the fall of communism. And as for that Chernobyl-set finish, it's nicely topped off with a cheeky, choppy nod to Alan Rickman's free-falling demise from the '88 original. Has it really been 25 years since the first utterance of: "Yippee kai yay, blankety blankers"? Now let's get this straight, I have zero interest in the inevitable sixth installment, but there are much more torturous ways to spend your Saturday night at the multiplex than - for simplicity purposes - Die Hard 5. Check your brain with the ticket tearer and take sweet satisfaction in things that go boom.